A man, Kevin Cogill, faces prison time for (noncommercially) posting music on a a blog (the supporting website is called Antiquiet) before its official release by the publisher. The same offense could occur with file-sharing. At issue is the Family Entertainment and Copyright Act of 2005 (also related to the Artist’s Rights and Theft Protection Act of 2005 and Family Home Movie Act of 2005). The text of the law is available at the Library of Congress site here. Tim Jones has a detailed legal analysis at the Electronic Frontier Foundation here. The music in question is from Guns N' Roses album “Chinese Democracy. EFF says that the blogger had been arrested at his home in Los Angeles at gunpoint in August 2008, and that much of the music (or perhaps all of it) had been available before. The recording industry says that pre-release leaks hurt opening sales (much as with the way some “popular” movie openings are handled, sometimes starting at one minute after midnight) but EFF contests this claim. Nevertheless, the government has written up draconian sentencing guidelines linked in the EFF story. He plead guilty and the government has asked for six months in prison. The maximum sentence could have been three years and a $250000 fine. The Los Angeles Times had printed a detailed story by Michelle Quinn and Swati Pandey on August 29, 2009, “Blogger Kevin Cogill charged with felony in leak of Guns N' Roses songs,” link here. The details of the LA Times are disturbing indeed. The music had supposedly been in development years. Cogill’s site crashed under network traffic when he loaded the streams in June, and he removed them after a few hours. Nevertheless, he soon received visits from the FBI, both at home and at work. He used a public defender for the case. I am personally much more familiar with the development of classical music (and independent film). Artists may not want the public to see their work before it is ready and sometimes this is a sensitive issue, and usually premiers of classical music generate a lot of buzz within a community. But it seems that in all cases, that the supposed financial impact is overblown. Of course, in some areas of the entertainment world, profit margins, particularly at opening, are a sensitive business issue. 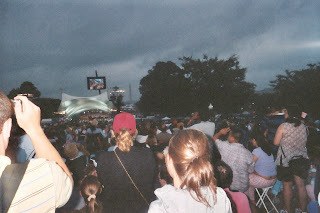 The picture comes from the 2004 National Mall July 4 Celebration in Washington DC, taken by me. When I review movies (on my movie review blog) and provide a decorative picture, I identify the picture as taken by me and where and when I took it, to preclude any possibility that someone could think that I snapped it illegally off the movie with a camcorder. For example, a film set in Washington DC could raise this issue, but I have many of my own aerial photos of the City taken by me from the Washington Monument.